November 16, 2016: Vice Admiral SR Sarma, AVSM, VSM, took over as Director General Naval Projects Visakhapatnam on November 1, 2016. 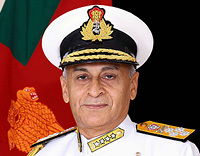 The Admiral was commissioned as an Electrical Officer into the Indian Navy in Aug 83 and holds a Masters degree in Computer Science and Engineering. 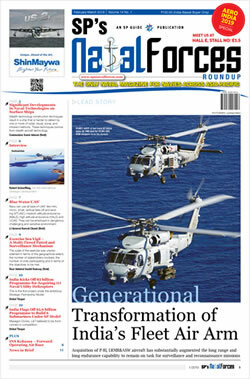 He is also an alumnus of the Naval War College. The Flag Officer, in his career spanning 33 years, has served the Navy in various important appointments including Operational, Staff, Dockyard and Research and Development. His afloat appointments include frontline Indian Naval warships Mysore, Krishna, Rana and Vindhyagiri. 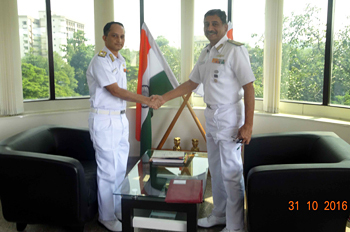 On promotion to Flag rank, the Admiral was appointed as the Assistant Chief of Materiel (Information Technology & Systems) at Integrated Headquarters, Ministry of Defence (Navy) at New Delhi, Admiral Superintendent at Naval Dockyard, Visakhapatnam and Chief Staff Officer (Technical) Eastern Naval Command, Visakhapatnam prior assuming charge as the Director General Naval Projects, Visakhapatnam. The Admiral is a recipient of the AtiVishisht Seva Medal and the Vishisht Seva Medal for his distinguished service.